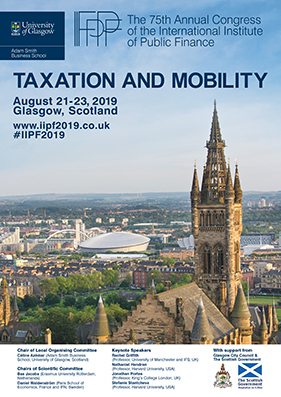 The 75th Annual Congress of the International Institute of Public Finance will be held in Glasgow, Scotland, UK, from August 21 through 23, 2019. Its Local Organizing Committee is chaired by Celine Azemar (Adam Smith Business School, University of Glasgow, Scotland). The Scientific Committee is chaired by Bas Jacobs (Erasmus University Rotterdam, Netherlands) and Daniel Waldenström (Paris School of Economics, France). The theme of the keynote speeches and panels will be "Taxation and Mobility". Contributed papers on any topic within the field of Public Economics and related disciplines will be considered, as is traditional at IIPF congresses. Submissions will be accepted as from December 2018 until 15 February 2019. For further instructions and information please follow the links below.